To secure a date, a 50% deposit due at the time of contract signing, which can be made payable in the the form of cash or personal cheque. The deposit is non-refundable and non-transferable after seven (7) days have elapsed from the date of contract signing. will be signed by the person booking services for a particular session, and will specify the location, date, time, number of persons receiving makeup service, and what time each person will have reserved. If services for more than one person are being booked, all deposits must be paid at the time of contract signing to guarantee each reservation. Due to the possibility of schedule conflicts, additional makeups added after contract signing or changes made to the location, date, and time of event will be done at the sole discretion of Makeup Design By Brittany Tuleja. Disposables are used and all brushes and makeup products are kept sanitary and are sanitized between every makeup application. Makeup products used are hypoallergenic. Any skin condition should be reported by the client to the makeup artist prior to application and, if need be, a sample test of makeup may be performed on the skin to test reaction. 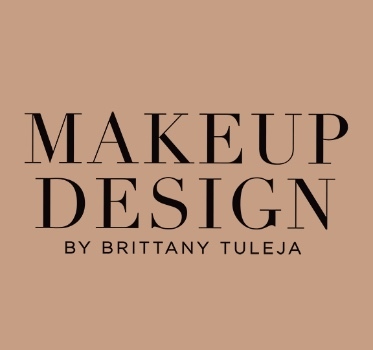 All clients must agree to release Makeup Design By Brittany Tuleja from liability for any skin complications due to any reactions. A consultation is usually required in this case for testing products and materials. A consultation is highly recommended for special occasions such as Bridal makeup. On the trial we will go over your likes and dislikes, while applying your desired look. Before and After photos will also be taken to document the makeup look. The Consultation fee is $90 US. A STANDARD BEAUTY MAKEUP IS $90 US. ALL OTHER MAKEUPS VARY UPON THE REQUESTED LOOK AND TIME IT WILL TAKE TO CREATE A MORE ADVANCED MAKEUP. PHOTOGRAPHIC HAIRSTYLING STARTS AT $90 US.